If you’re one of the two out of three Windows users who also own Apple products, you may not realize you can use the traditionally adversarial platforms to get a productivity edge. 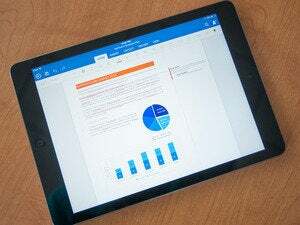 Microsoft made waves when it launched Office Mobile for iPhone and the Office for iPad apps, but those were just the biggest steps in a strategy the company has been building for awhile. As a result, there are a slew of iPhone apps to help those who depend on Microsoft tools to get things done. Here are the 10 most essential. OneNote is the unsung hero of Microsoft Office. It was the first Office product offered on outside platforms like iOS and Android, as well as the first to receive a Windows 8 Modern UI overhaul. The result is an app that lets you record moments, take notes, maintain a to-do list and more from virtually anywhere. The OneNote app ties in to your Microsoft account to access and sync files through your OneDrive, OneDrive for Business, or SharePoint account. You can add pictures, checkboxes, and bulleted or numbered lists from the iPhone, and you can perform limited text formatting. 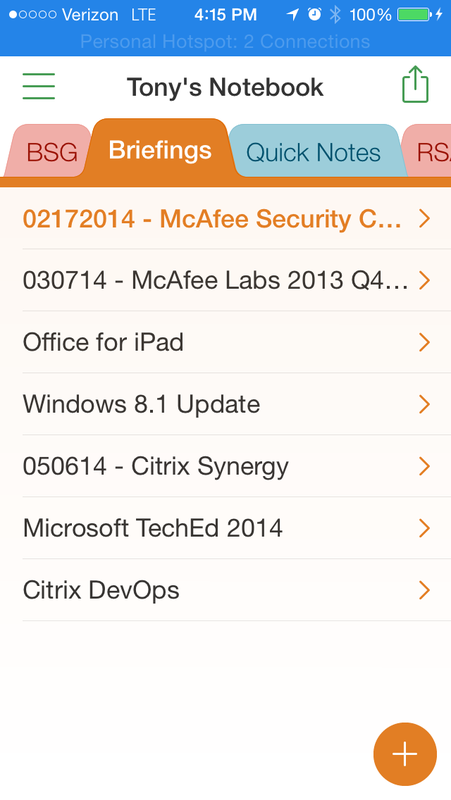 Office Mobile for iPhone delivers the three core Office apps—Word, Excel, and PowerPoint—to the iPhone. When Microsoft first launched Office Mobile for iPhone, using the app required an Office 365 subscription. Microsoft has since removed that restriction and now offers the app for free. The capabilities of Office Mobile for iPhone are admittedly limited. You won’t be writing the next great American novel, or creating a massive Excel spreadsheet with sparklines and pivot tables. But, you can review and edit existing files and create basic documents. Office Mobile for iPhone even includes templates for common documents you might create from a smartphone, like Agenda, Budget, or Mileage Tracker. If you have an Exchange or Office 365 email account, you can easily add it to the default Mail app in iOS. OWA (Office Web Access) for iPhone provides a more native Outlook experience, though, and includes some features that don’t exist in Mail. 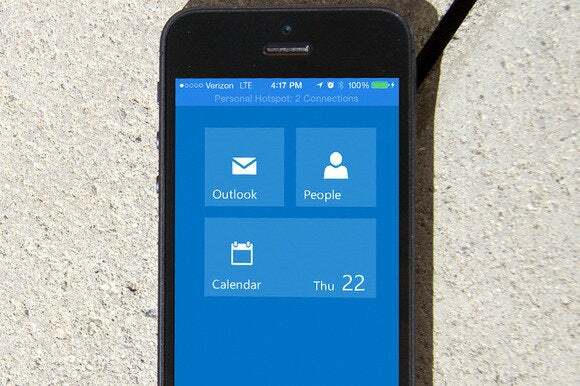 First, OWA for iPhone provides access to your Outlook email, contacts, and calendar. It can sync your contacts from your iPhone, but it's optional, so you aren’t forced to integrate the two. OWA for iPhone lets you configure an automatic reply for incoming emails and save folders for offline access. It's also more secure than Mail because you can set up a PIN to prevent unauthorized access to your email, even if you let a friend or child borrow your iPhone. FaceTime works only with other iOS or Mac OS X devices, but Skype can be used on a wide variety of platforms. With the Skype app, you can make free Skype-to-Skype video calls or instant-message your contacts over cellular or Wi-Fi networks. 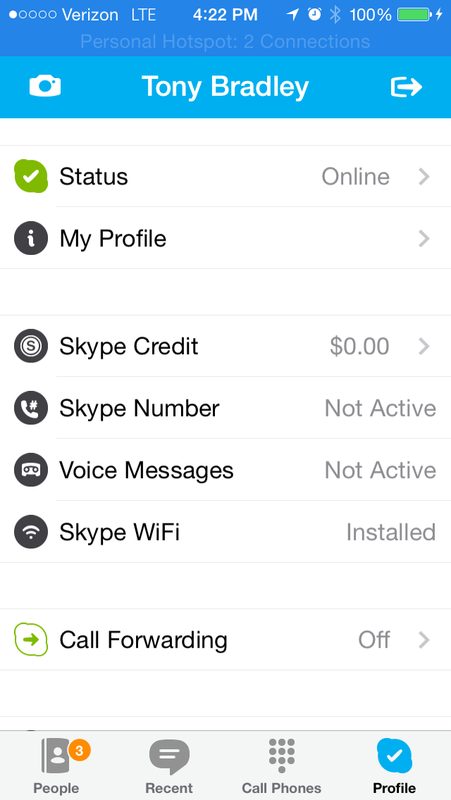 If you buy Skype Credit or have Skype minutes available through an Office 365 subscription, you can also use Skype to call non-mobile, non-Skype phone numbers. You can also record and send a video message to contacts who are not currently available. Yammer is an enterprise-centric social network that enables peers within a company to network with one another and share information—sort of like Facebook, but with a business focus and fewer frivolous distractions. If your company uses Yammer, you can use the iPhone app to stay in touch with co-workers from your iPhone no matter where you are. You can read the latest information from Groups you follow on Yammer, stay engaged in message threads with coworkers, and collaborate with your team from your iPhone. 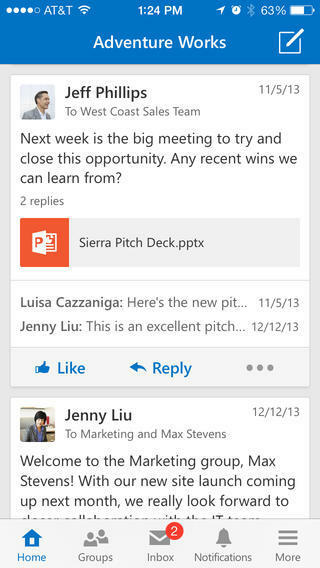 You can also view Microsoft Office documents, Notes, images, and PDF files from your Yammer feed from within the app. OneDrive (formerly SkyDrive) is Microsoft’s cloud file storage service. It is tightly integrated with Windows and with Microsoft Office (including Office Mobile for iPhone). 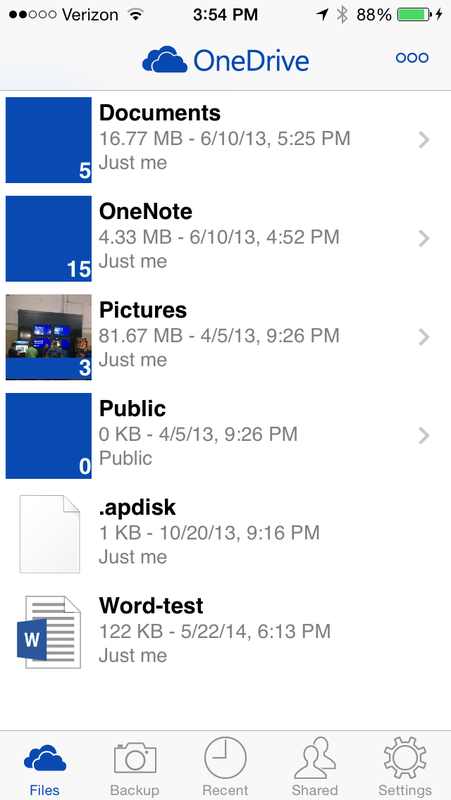 The OneDrive app for iPhone lets you browse all the files you've stored in the cloud. You can move, delete, and rename files, and create new folders in OneDrive from the app. 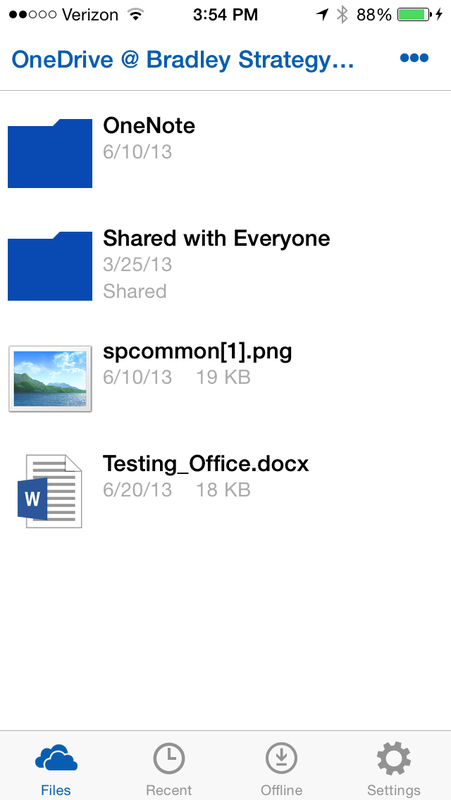 You can open files from the OneDrive app in other appropriate apps, such as opening a Word document in Office Mobile for iPhone. One of the best features is the ability to upload photos and videos you capture with your iPhone automatically to your OneDrive account. iOS does this natively by making photos available through PhotoStream in iCloud, but PhotoStream doesn’t sync videos. With the Camera Backup option enabled, you can rest assured that your photos and videos are safe even if your iPhone is lost or stolen, and you’ll be able to access them from any Windows or Mac PC, tablet, or smartphone without having to figure out how to transfer them. OneDrive for Business (formerly SkyDrive Pro) is similar in function to the OneDrive app, but—as the name implies—it has a business focus. Rather than connecting to a consumer OneDrive account, OneDrive for Business requires either a SharePoint Online or qualifying Office365 account. Because it’s business-focused, OneDrive for Business doesn’t offer the feature to automatically back up your photos and videos. It does, however, include a feature to store files for offline access so you can make sure important documents are available to you even if you don’t have a cellular or Wi-Fi signal. The Lync 2013 iPhone app is a mobile extension of the voice and video calling, instant messaging, and video conferencing platform. You can start or join group communications via instant messaging or video, and join or initiate a Lync Meeting to present or collaborate. Users without a Lync 2013 account can still use the app if they've been invited to a Lync Meeting, but in order to use all of the features and capabilities of the app a Lync 2013 account is required. SharePoint Newsfeed lets you stay connected to any SharePoint sites you're following from your iPhone. 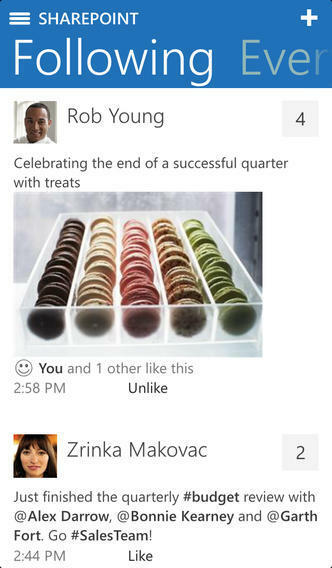 You can view posts and comments from colleagues, upload photos, and access documents stored on the SharePoint site. The SharePoint Newsfeed app works only with SharePoint 2013 and SharePoint Online sites. Previous versions of SharePoint are not supported. One cool thing is that you can @mention co-workers, like on Facebook or Twitter, to bring posts to their attention or pull them into the conversation. You can also use hashtags with posts to make topics and information easier to find when you need it. You aren’t limited to just the native iOS apps Microsoft has developed. With the Remote Desktop app you can connect remotely from your iPhone to an actual Windows PC and use all of its applications and capabilities as if you were logged in locally. Remote Desktop comes in handy for running an application that doesn’t have an equivalent iOS app, or for IT personnel to be able to manage and maintain servers remotely from an iPhone. Remote Desktop is a valuable tool to have available, but the iPhone display is small so it can be difficult to manipulate applications on the remote desktop. It works better with Windows 8/8.1 PCs because the OS itself is designed for interaction via touch.